I'm interested in buying a full set of Canon i-SENSYS LBP-7780Cx toner cartridges, but with the high capacity black cartridge in place of the basic version. Can I do this at a reasonable price? We only currently stock a 4 colour Canon 732 toner multipack which contains the standard capacity Canon 732 black toner, not the high capacity Canon 732H black toner. The high capacity Canon 732H black toner cartridge can only be purchased individually or with the other three colours individually, or in addition to the 4 colour Canon 732 multipack for the i-SENSYS LBP-7780Cx colour laser printer. Where can I send used LBP7780Cx toner cartridges to be recycled? Offices in need of a colour laser printer but with limited space may opt for the Canon i-SENSYS LBP7780CX colour laser printer. This printer comes with built-in networking connectivity and it can deliver excellent output. It has a maximum resolution of 9,600 x 600 dpi and has quick print speed. The Canon i-SENSYS LBP-7780CX A4 laser printer has a monthly duty cycle of 75,000 pages. It is integrated with 768 MB of memory and offers a USB host. Wi-Fi connectivity is not standard to the device. 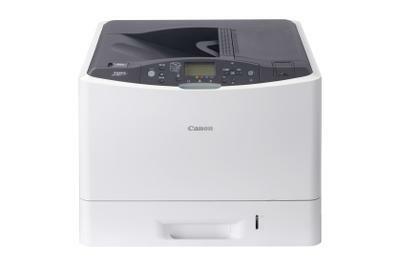 The small and robust Canon i-SENSYS LBP-7780CX colour printer measures 517 x 530 x 401 mm and weighs 31 kg. It has a small control panel with a 5-line monochrome LCD display plus LED indicator lights and operation keys. The i-SENSYS LBP-7780CX printer can handle 600 sheets at a time and an optional 500-sheet cassette is available. Print speed can go as fast as 32 ppm with the first coloured page out in 10.4 seconds and first monochrome in 10.2 seconds. Users don't have to wait long to get their prints from the quick Canon LBP7780CX A4 colour laser printer. This model takes up little space and requires low maintenance. It is very easy to use and it offers double-sided printing to help cut back on paper waste. The Canon LBP 7780CX i-SENSYS printer can be easily shared in a workgroup as it works on PC and Macintosh plus it has built-in Ethernet. Colour cartridges for the i-SENSYS LBP7780CX can print up to 6,400 pages and deliver a low cost-per-copy. The Canon 7780CX laser printer could be better if it had Wi-Fi as well as a USB host to allow direct printing from devices and thumb drives. The control panel of the LBP-7780CX is not very intuitive.